Most ex-cable and ex-satellite customers do not leave their service because they are dissatisfied with the content. That said, it’s clear sports are much less effective at keeping people subscribing to the big bundle than is commonly believed. According to survey data from the Hollywood Reporter, The overwhelming reason for quitting cable or satellite television remains cost. 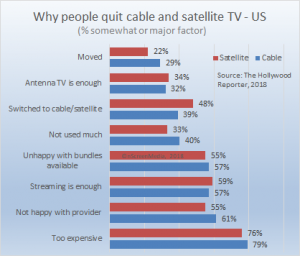 Three-quarters of satellite and 8-in-10 cable ex-customers said that the cost of their service was somewhat of a factor or a major factor in their decision to leave. Many ex-subscribers were unhappy with their provider. Cable customers were significantly less happy than satellite customers. However, significantly more ex-satellite customers indicated they quit to switch to cable than vice versa. The power of triple and double-play packages could be a significant factor driving this difference. Two-thirds of cable customers have 2 or more services from their cable operator making switching more painful than single-play satellite. Streaming services are now a major factor in many people’s decision to leave cable or satellite. 3-in-5 ex-cable and ex-satellite customers said that they somewhat or strongly agreed that their streaming services provided enough content for them. Interestingly, most people (60% of ex-cabler and 67% of ex-satellite customers) did not feel the amount they used their pay TV services was a factor in them leaving. In other words, they were still finding interesting and engaging to content to watch through the services. There certainly is a level of dissatisfaction with the channel bundles available. However, that could be due to frustration with the bundling mechanism, not the content at all. In many surveys, 80+% of people say they want to pick the channels in their channel bundle themselves. Unsurprisingly, TV shows are a daily habit for half of the consumers. Movies and sports, on the other hand, are weekly habits. 45% watch movies weekly and 37% watch sports. However, fewer people overall watch sports. 45% say they watch live sports at least monthly, whereas 64% said they watched movies that much. 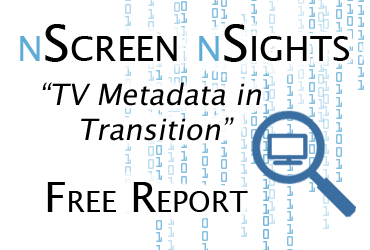 Though we watch movies less frequently than TV shows, they command a lot of our attention. 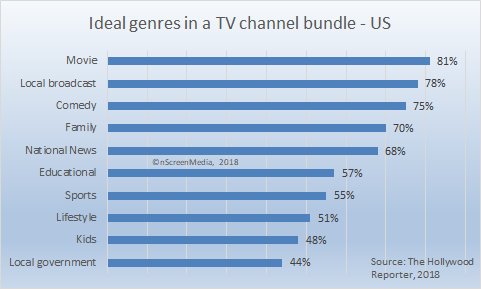 When asked to choose genres for a television bundle, 81% said that movies were somewhat or very important to them. Local broadcasts were the second most important, with local broadcasts and comedy just behind with 78% and 75% respectively. Family content and national news round out the top 5 genres, with 70% and 68% respectively. There is quite a big drop off in interest below the top five. Educational content was ranked 11% lower than national news. Sports, with 55%, was fourth from bottom in consumer rankings. Sports get the credit for keeping many people with their pay TV operator. However, sports’ low ranking in both viewing and importance could indicate it is much less of a factor for at least half of consumers than previously thought. Most ex-cable and ex-satellite customers do not leave pay TV because they are dissatisfied with the content. Cost and the availability of quality content online are significant factors in cutting the cord. Sports are less influential in keeping people subscribed to satellite and cable than many assume.